Jerry Miles of Middlesex, Veteran of Civil War, Dropped Dead. Middlesex, April 18. -- Jerry Miles, colored, and a veteran of the Civil war, died suddenly at his home in this village today. This forenoon at 9 o'clock he was sitting in a chair, apparently in his usual health, when he was seen to slip out and fall to the floor. After gasping a few times he died. He had been troubled with heart disease. He was born in Virginia about 70 years ago and when the northern soldiers went into that state during the Civil war he followed them about and later began driving a mule team for them. Afterwards he enlisted in the 36th (sic) United States Colored Regiment. Following the war he joined the John Brown colony in New York state but he had lived many years in Middlesex. He was married 30 years ago and leaves his wife and three children, Frank, Hattie, and Grace. 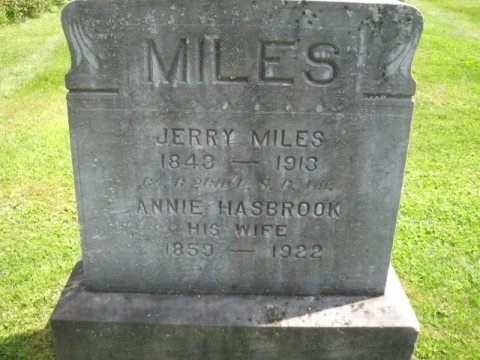 Webmaster's Note: Jerry Miles actually served in the 26th U.S. Colored Infantry, not the 36th.